I'm always reading something, usually multiple books at a time. Meghan is a popular mommy blogger married to Jack, a sportscaster. They have two beautiful children, six-year-old Lucy and four-year-old Lachlan, and Meghan is pregnant with their third child. Agatha, who works part-time stocking shelves at the London grocery, is an avid fan of the blog and watches Meghan from afar until a chance encounter in the store leads to a friendship. Agatha tells Meghan that she is also expecting a baby, right around Meghan's due date. The novel switches back and forth between Meghan's and Agatha's first-person, present-tense narration. Agatha has struggled to get in touch with Hayden, deployed overseas with the Royal Navy, to tell him that their brief liaison has led to a pregnancy. Eventually, her communication with a navy liaison forces the issue and compels him to get in touch by Skype. 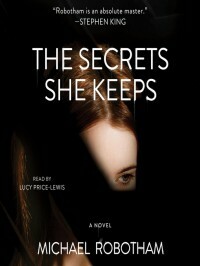 Although the title refers to the secrets "she" keeps, there are multiple characters keeping secrets, and not all of them are female. The novel is not really a "whodunit," because the "it" unfolds so that the reader knows the doer, and the suspense comes from how the events unfold and how law enforcement figure out what has happened. I won't get into more detail than that (to avoid spoilers), but I found this book utterly addictive.